Balancing between the competing risks of tumor death and toxicity with the influence of comorbidity and ageing on both, prognosis and treatment tolerability are essential for treatment decisions in elderly patients. For patients enrolled in clinical trials, meta-analyses have shown an efficacy of chemotherapy in elderly patients similar to younger patients and no major differences in treatment effect. Nonrandomized phase II trials in elderly patients demonstrated similar results with chemotherapy as for younger patients. 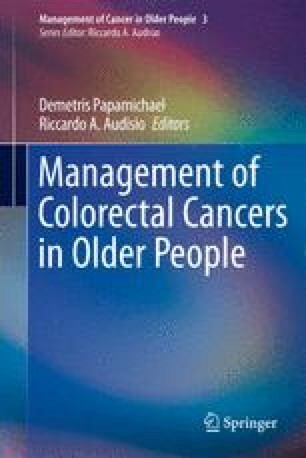 These analyses have therefore the methodological problem that the age distribution in clinical trials does not reflect daily clinical practice and that only a subset of elderly patients participated in the trials. The British FOCUS 2 enrolling frail patients demonstrated a better “overall treatment utility” if patients were treated with combination chemotherapy instead of fluoropyrimidine monotherapy.